The oppositional β3-structure is the logical tetrahexahedron of Sauriol (1968), rediscovered independently (at a time in which Sauriol’s works war ignored by them) by Pellissier (2008) and Smessaert (2009). This βn-structure is very interesting since, differently from the previous ones (i.e. the β0-, the β1- and the β2-structure – at least as long as we currently know) it can be generated by several different γ-structures (that is, by several γ-structures which are not mutually isomorphic). This means that the β3-structure makes it possible (along with Pellissier’s intuition of this) to put into “oppositional equivalence” structures which otherwise seem utterly different the one from the other. NOTA BENE 1: as it seems, Lewis Carroll was quite close to discovering this structure, although he seemed to have a huge obstacle in front of him: the absence of any kind of knowledge of the structure of the logical hexagon. This can be seen in some works of him, published posthumous, on “logical charts” (cf. Moretti, A., “Was Lewis Carroll an Amazing Oppositional Geometer?”, 2014). 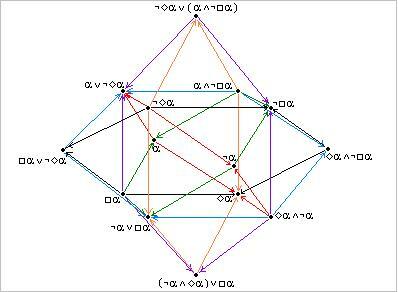 NOTA BENE 2: In Smessaert and Demey’s “logical geometry” this structure, expressed differently (i.e. by highlighting other relations instead of the implication arrows, is called “rhombic dodecahedron”. As such, in some sense it had been partly discovered by Zellweger. Sauriol, P., « Remarques sur la Théorie de l’hexagone logique de Blanché », Dialogue, 7, 1968. Sauriol, P., « La structure tétrahexaédrique du système complet des propositions catégoriques », Dialogue, 15, 1976.